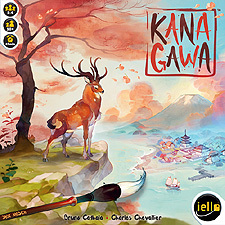 Kanagawa is a strategic and poetic card game in which you must paint the most beautiful Print. Improve your Studio to immortalise the most beautiful subjects through the seasons and become the most prestigious student of the painter Hokusai. ...and become Hokusai's worthy heir! The pastel colours and initial premise of painting a picture didn't immediately inspire me to rush to play Kanagawa. Fortunately a friend persuaded me to chance a game and I was hooked. It's a fairly light game and though the theme is there well supported by the art work of the tiles and other components, but the pleasure of this game lies in the mechanics and how best to use the tiles that you gain each turn.